Have you ever tried out the brushes from itCosmetics? OMG, they are seriously ah-ma-zing! Not only has itCosmetics become one of my favorite brands overall, but also their brushes are part of my everyday makeup routine! This new Limited Edition Heavenly Luxe Vanity Brush Set is a perfect introduction into itCosmetics brushes! 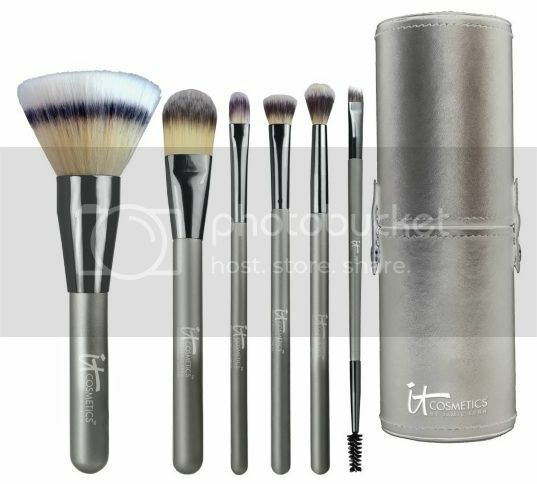 If you have been looking to try itCosmetic's brushes, now is a great time with this awesome brush kit! 6 Essential Brushes in a Travel Size Kit! Get the airbrushed look with the Limited Edition Heavenly Luxe Brush Set. These 6 must-have brushes take makeup application to the next level, giving you effortless distribution of all of your favorite cosmetics without tugging on your skin! The Limited Edition Heavenly Luxe Vanity Brush Set offers six full-size, ultra luxe, ultra-plush brushes made from 100% cruelty free hair in a chic and convenient vanity case. Store these gorgeous brushes anywhere for application on the go! There are many features that I love about this kit and the container is one of them! As someone who usually uses a brush roll for travel, the idea of traveling with this sleek little canister tube is exciting! To pack for a trip, all you need to do is stick the brushes that you need in this tube and then snap it up! Your brushes are completely protected!!! Then, when you get to your destination, you just unsnap and open up! It is perfect! This kit is not just great for travel. 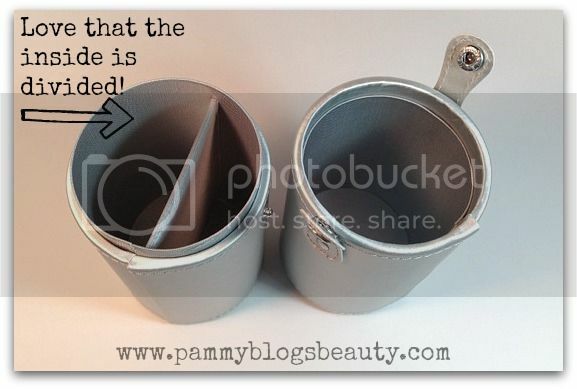 You could store your brushes in this canister container every day! Actually, that is what I do. I just open it up and place all of my itCosmetics brushes inside. Love it!!! 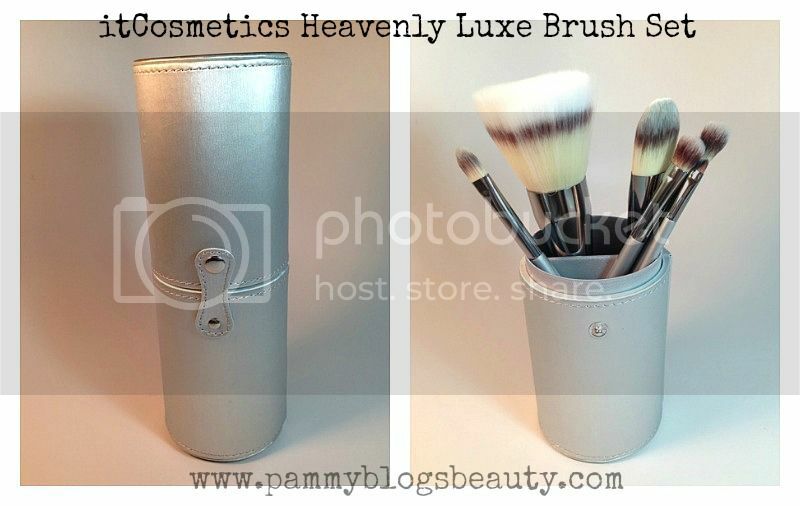 Heavenly Luxe Dual-Airbrush Multi-Powder Brush: Wow! This brush is HUGE! Seriously, this might the largest face brush in my brush collection. The ultra soft brush bristles splay about a 2 inch diameter. They are not densly packed. The brush has a "fluffy" and soft feel. 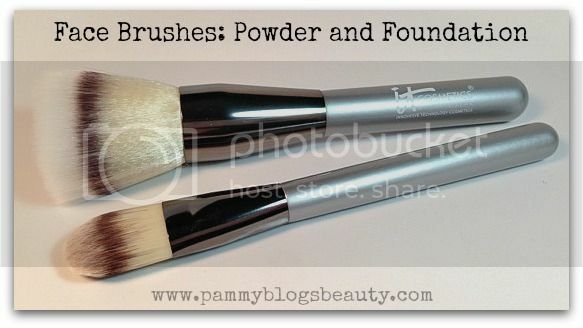 This brush is ideal for finishing powder or a light application of powder foundation. This brush is actually perfect for me. Day-to-Day, I love wearing powder foundation. However, due to the inadequate lighting in my makeup area (we just moved and I haven't completed my makeup area set-up), I tend to over-do my powder. The loose bristles on this brush and the larger size allow for a nice and light powder application. That is just what I need. I love this brush and currently use it almost every day! Heavenly Luxe Airbrush Flat Foundation Brush: This flat foundation brush is ideal for liquid foundation application. In the past, I have not been a huge fan of flat foundation brushes as the application could get streaky depending on the brush. Well, not with this brush! Foundation applies easily with this brush! I love the density of the brush hairs on this foundation brush. Heavenly Luxe Airbrush Flat Concealer Brush: I can always use another concealer brush! This one is the perfect shape for working concealer into your under eye area. 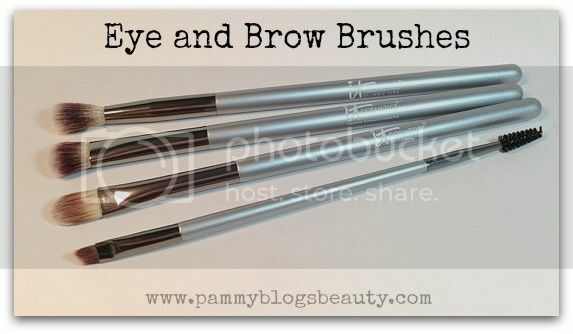 I love the softness of this brush for the delicate under eye area. "No Tug" Airbrush Crease Brush: This fluffy crease brush is great for either applying a light layer of shadow or for blending out the crease. The fluffiness of this brush especially helps with the application of shadows that are very pigmented that you want to give a soft effect to. "No Tug" Airbrush Allover Eyeshadow Brush: This is the quintessential eyeshadow brush! It is absolutely the perfect shape and size for applying eyeshadow to the lid. I have literally been using this brush every single day since I got this kit! It will continue to be my everyday favorite eyeshadow brush! "No Tug" Eyeliner & Brow Brush with Spooly: This is a dual ended brush: one side is the Spooly for brown combing/shaping and the other side is a thin angled brush for either eyeliner application or brown powder application. I really like lining my eyes with this! The thinness of the brush allows you to make very precise line. What a gorgeous set!!! The container is just such a great idea for both brush storage and travel. Plus, the brushes are gorgeous and of phenomenal quality! If you are looking for a great intro set of brushes or a nice travel set, be sure to check out this kit before it sells out! Wow, all of these for only $49? It's a mud-have then. I bought one crease brush from Make Up For Ever for $30, geez!